Within the European context of innovation for growth, public and corporate actors are faced with pressing questions concerning innovation policy and the return on public and private investment in innovation at the regional level. To help them answer these questions, researchers in the field of Geography of Innovation propose interesting developments and new perspectives for the analysis of localized innovation processes, interactions between science, technology and industry, and their impact on regional growth and competitiveness, offering new foundations for designing and evaluating public policies. The aim of this book is firstly to highlight major recent methodological advances in the Geography of Innovation, particularly concerning the measurement of spatial knowledge externalities and their impact on agglomeration effects. Strategic approaches using microeconomic data have also contributed to showing how firms’ strategies may interact with the local environment and impact upon agglomeration dynamics. 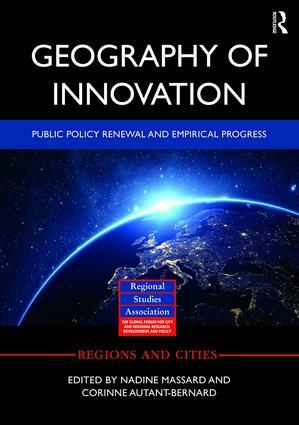 Interesting new results emerge from the application of these new methodologies to the analysis of innovation dynamics in European regions and this book shows how they can help revisit some of the main tenets of received wisdom concerning the rationale and impact of public policies on the Geography of Innovation. This book was previously published as a special issue of Regional Studies. Nadine Massard is Professor in economics at the University Grenoble Alpes (France) and member of Grenoble Applied Economics Laboratory (GAEL, INRA, CNRS). Her main research theme is Economic Geography of Innovation and Public Policy. Currently she is the President of EuroLIO (European Localized Innovation Observatory). Corinne Autant-Bernard is Professor in economics at Saint-Etienne University. Author of dozens of articles and book chapters in economics of innovation, she studies spatial concentration and networks of innovation and their impacts on productivity. She also contributes in technological transfer, providing policy makers with localized innovation diagnostics and policy evaluation.